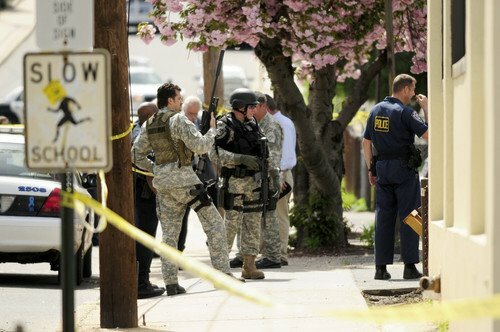 The caption insists the photo is of “Middletown police and Wesleyan University security”, which perhaps makes it even more disconcerting to see them decked out in military garb, yet further evidence of the militarization of U.S. law enforcement — a trend made more disturbing by the number of cops that have served in the military or are in the reserves, and one accelerated by the bipartisan fondness for adopting the language — and tactics — of war to fight illicit drugs. Once again, cops aren’t soldiers. American cities aren’t battlefields. And U.S. citizens aren’t potential combatants. This isn’t pedantry. It’s about the mentality with which police officers approach their job, and about what sort of relationship they’re going to have with the people whose rights they’re supposed to be protecting.